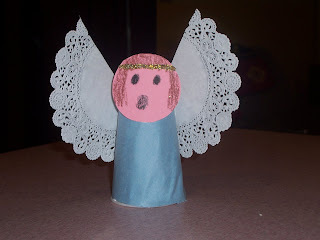 Preschool Playbook: "Hark the Herald Angels"
Love to hear the angels sing this time of year. I have a few angels to send your way. There are also a couple of cute angels over at Creative and Curious Kids, feel free to take a look. The first angel idea I have I got from The Mailbox, Kindergarten 2002-3 issue. They called her a Musical Paper Angel. My angel isn't' quite so musical, but it is along the same lines. a paper cup, mine was 7oz. The first and most difficult paper was to cover the cup with some construction paper . If you already have a fancy paper cup, you won't need to do it, but mine was Diego, so I thought I should cover it. I cut a piece of 9 x 12 construction paper in half diagonally. Then I covered the whole cup with tacky. I wrapped the paper around the cup, cutting off any overhang. A grown-up might have to do this. 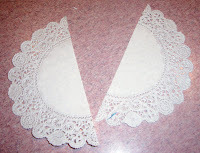 Next take a doily and cut it in half, these are the wings. Glue the wings to the back of the cup. Now for the head. In the book, they used a colored styrofoam ball. 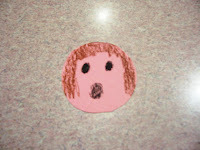 I just cut a circle out of pink construction paper, drew a face and some hair, then added a glitter halo. I then glued it to the front of the cup. 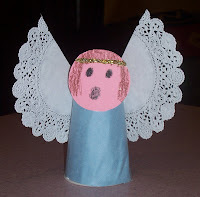 Now, my angel's mouth is an oval shape--like she is singing--my kids didn't quite get it. They wanted to know why she was screaming. Oh well, I tried. If you like, you can put her on top of a small Christmas tree. You could also use a toilet paper tube instead of a cup for a body. 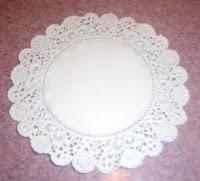 You can still place this on a tree. My son loves to make the angel "fly" around the house. At least he is enjoying himself.